When we pause once a year to remember 1776, we invoke the names of wise aristocrats, learned in political theory -- Jefferson, Adams, Madison. Or we toast the likes of Franklin, Hancock, Washington; practical men of business and wealth who set the country running. The historian Gordon Wood has pointed out how this remarkable oligarchy created a nation where, whether they knew it or not, the power would pass down after them in such a way that men like them would rarely if ever rise to rule. And they have not, and we marvel, today, at why such an American generation has not come again. But they were not the whole revolution. The people -- at least the third or so among them who supported the idea -- made the revolution. This is as much their day as Jefferson's. Their political theory may have been wanting, their views on race certainly were deplorable by modern standards, but neither were they sitting passively at home in June 1776 while the great minds pared Tom's prose in Philadelphia. If they did not hear the Declaration read aloud that day, it was because they were too busy, about and doing. Every July 4 I make a silent toast to one cluster of them, in the county just west of Philadelphia. I'll share them with you this year. They are a knot of families named Hannum, Gibbons, Harper, Cheyney, and Vernon that I once untangled in the course of researching a book. There was so little of them left; not enough material to make a book of its own, Perhaps just enough for a long blog post. The moths have eaten the rest, if it ever was written down, and what's left mostly are a few family stories that break through the silence like a glimpse of landscape on a fog-bound day. This was barren soil to sow a revolution. It was a Quaker county, but the ranting religious immigrant families long had settled into a conservative hierarchy fond of the king. The Revolution's few friends arose among the families that had been read out of the Quaker meetings for being too obstreperous and witty, for playing fiddles or arguing about theology like the Scots-Irish men they tended to marry. They had known from birth what it means to live true to yourself in a monolithic culture that held other principles. They had found each other, and woven their families together in two or three generations of marriage. 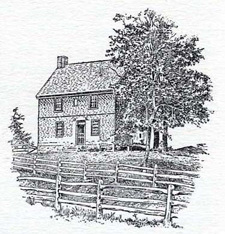 Persifor Frazer and Polly Taylor married in 1766 and lived a decade later with their four young children on a farm in a hilly district a few miles from a lazy creek called the Brandywine. The land had come through her family, but it was Persifor who farmed it and who mixed in local politics, in the perpetual minority party in the county, headed by Anthony Wayne, that resisted a growning Crown power. When Pennsylvania formed its troops for the Continental Army in early 1776, Frazer was elected captain of a company in the Fourth Battalion, which had Wayne for its colonel. He already was in uniform when the Declaration was signed. The war came home for these people on Sept. 11, 1777, when the British marched up from Delaware bound for Philadelphia, and George Washington tried to stop them at the Brandywine. "September 11th" always was Brandywine day when I was growing up there, and Chris Sanderson the old fiddler came to our elementary school and told the stories. I suppose that's changed now. The little Frazer girls were at school in Thornbury that day. They heard the gunshots and cannon firing on the hot fall day. Sally, the oldest, was 8 then. The teacher went out and listened for a while, then returned and said, "There is a battle not far off, children; you may go home." "As we returned, we met our mother on horseback," Sally wrote years later, "going over towards the place of action, knowing that ... our father must be in the midst of the affray." The Americans held the river crossing, but the British pulled off a daring move and, relying on loyalist guides to take them over the up-stream fords, dropped a third of their army on Washington's right and caved in the rebels' flank. Washington had had confused reports all day from this quarter, some saying the British had a force headed in that direction. But the most authoritative reports from his officers reported no enemy in front of them. At one point a local farmer, one of the Cheyneys in the extended clan, rode in and insisted a large redcoat attack loomed on the right. Washington took the reports of his own officers, naturally, as more reliable than that of a local farmer, but Cheyney broke into an impassioned insistence: "If you doubt my word, put me under guard until you can ask Anthony Wayne or Persie Frazer if I am a man to be believed." Then he turned on the staff officers, who perhaps hads been snickering at the clodhopper, and fulminated, "I would have you know that I have this day's work as much at heart as e'er a blood of you." The names of Frazer and Wayne evidently moved Washington to send reinforcements to his right, just in case. Washington knew the value of such men, though they lacked the polish of staff officers. The reinforcements arrived in time to help hold off the heavy British attack, which did come after all, long enough for most of Washington's army to escape the trap. The British moved on after them, but they took time to smoke out the rebels they knew lived in the neighborhood. History books may have forgotten their names, but the British army knew them. And they knew there was a chance they could catch the troublemakers at home, or at least harrass their families. Two days after the battle, a British detachment showed up at Frazer's home. 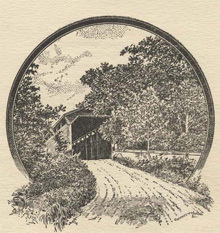 Polly Frazer, hearing the approaching hoofbeats, chased her children, along with an aged aunt, some servants, and a wounded American soldier, into the woods and stayed to face the British alone. A British officer confronted her: "Where are the damned Rebels?'' She told him there were none about. He cursed her, while soldiers pushed into the house and stripped the barn, looking for stores of weapons, and incidentally taking as plunder anything that could be sold or eaten. They carried off the family's wheat stores and its horses. The British officer in charge then tried a more logical approach with Polly Frazer. He told her how American military leaders who joined the British were well rewarded for their loyalty. No doubt Polly knew it was true, but she laughed him off. "You do not know Colonel Frazer," she said, "or you would not suggest such a thing, nor would he listen to me were I to propose it." Furthermore, she said, if her husband did take sides with the British, she would "never consent to have anything more to do with him." Before they left, the officer told Polly he had orders to arrest Frazer and burn the house and barn. "But," he said, in a generous gesture, "I give them to you." Polly didn't buy it. "I cannot thank you, sir, for what is my own, and if you had such orders you would not dare to disobey them." After the American defeat Frazer had been sent out to scout the local roads to watch the movements of the main British army and report them to Wayne. In fact, he had left his farm just a few hours before the British arrived. He was captured spying two days later and sent to the notorious Walnut Street prison in Philadelphia. There, contrary to British military regulations, the provost, a loyalist horse-breaker named Cunningham whose name once was despised and feared, kept the prisoners in misery, torment, and starvation. Cunningham and his immediate superior made sure word of conditions in the prison never reached higher authorities. But Polly Frazer and Jane Gibbons arranged to smuggle out a letter written by the prisoners. They visited their husbands with permission from the authorities. While they were leaving, the provost ordered them searched. Polly meekly submitted, while Jane raised a royal row about it and tried to flee. The guards grabbed her and Tory women were brought in to subject her to a scrupulous strip search. The unoffending Polly got out with a cursory examination, but it was she who had the prisoners' letter in her petticoat, along with a sample of the mouldy bread they were fed. They left the city and dashed up to Washington at Valley Forge, who appealed to Howe's sense of military honor with the result that conditions in the prison improved. Persie and Polly are buried in the old graveyard at Middletown Presbyterian Church. Their house was abandoned after a fire gutted it in 1926. A chimney and a wall are all that remain. I can't even find a picture of them to break up the text of this long story. Below the pantheon of the Founders were the practical operators like Anthony Wayne, who also tend to get into the history books in a few places. But below them were the Frazers and thousands like them. And below them still were a class of young families who didn't even own land and whose very names are too smudged to read on the muster rolls anymore, but who pitched into the cause such fortunes as they had, along with their lives and sacred honor. Never forget that had "this day's work as much at heart as e'er a blood of you." � July 4, 2006 Douglas Harper Moe: "Say, what's a good word for scrutiny?" Shemp: "uh ... SCRUTINY!"